Common grazing land often supports a range of different vegetation.Commonly known as ‘laughing gas’ and currently used both in anaesthetics and as a ‘legal high’, nitrous oxide (N2O) is a powerful greenhouse gas produced in the soil by micro-organisms, especially so on land grazed by animals. Researchers from Bangor University are to lead an international team to explore the interaction between sheep grazing behaviour, urine composition and subsequent nitrous oxide (N2O) emissions from urine patches, which are ‘hot spots’ for N2O production and emission. The results will provide an important element in understanding the UK’s overall greenhouse gas production. Professor Dave Chadwick from Bangor University’s School of Environment, Natural Resources and Geography will be leading the team of researchers from Bangor University, Rothamsted Research, Swansea University (in collaboration with Texas A&M University-Kingsville) and Leicester University in the Natural Environment Research Council funded 3 year research project. Previous studies have been limited to measuring N2O emissions from controlled plot experiments where urine has been ‘applied’ to soil, or have investigated emissions under lowland conditions i.e. of urine composition, soil types, and climate. But in the new Upland-N2O project the research team will explore the effects of grazing and livestock movement in more extensive pastures, in upland areas where sheep have the opportunity to range and select herbage. This could influence urine composition and subsequent N2O emission. Where urine is deposited could also influence emissions, and is predicted to vary with soil pH, water balance and local climate. 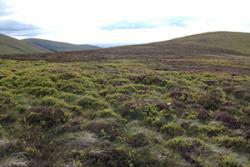 In the uplands, soils are often more acidic and wetter than in lowland grazed pastures, and the climate is often much harsher. The team will explore the effects of these vegetation, urine composition and climate factors on N2O emissions to get a better understanding of how much greenhouse gas is generated in upland pastures. 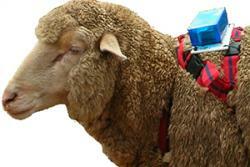 The monitoring equipment carried by the sheep will look similar to this.Professor Chadwick said: “The project will be based at Henfaes, Bangor University’s Research Station, where the team will collate ‘layers’ of information known to affect N2O production in soils, and subsequent emission, for example the climate, topography, soil type, vegetation composition, sheep movement, urine deposition patterns and urine composition. We will also be conducting some controlled experiments to determine what factors are important in controlling N2O production and emission from urine patches, such as the urine nitrogen content, level of soil compaction. “Sheep will be fitted with collars that include a variety of state-of-the-art sensors to track their movement and behaviour in extensively grazed pastures on the enclosed hill land and the open common land on the University’s heft.